I love this nightstand! The picture does not do it justice and it fits perfect with my farmhouse theme. The item arrived quickly and it wasn't too heavy to place either. Organize your bedside necessities with this classic nightstand. Constructed from solid wood and veneer, this reliable stand features one small top drawer and a large bottom drawer that are both lined with felt. The rustic grey finish melds well with a variety of styles for convenient decorating. Great color, great look, great product! There are two drawers total since the bottoms two are combined into one deep drawer. Like this feature since larger items can be store as well! I also love the finished look with the bun feet. We did have to exchange the first one sent to us due to a missing part on one of the drawers. It was a very easy return process and customer service was very friendly! The Gracewood Hollow Rustic Nightstand is beautiful! It is the exact colors as advertised. The nightstand is the perfect height and has ample storage. It arrived quickly and was well packaged. The bottom feet were the only assembly required. The feet were also well packaged and placed in the bottom drawer so there was not any scratching to the nightstand. We highly recommend this nightstand and look forward to the other pieces of this set to arrive. Fast delivery and packaged well. The nightstand is just as described. The color is perfect for my rustic home. I've had this for a few months now. I don't like that only the top drawer is lined but the bottom is not. Also, you have to push the drawers firmly to close fully into place. This nightstand is beautiful and feels well made. One of the best parts is it came fully assembled. The only thing we had to do is screw on the feet to the four corners with no tools required. Love that! The drawers open and close smoothly as well and the top drawer has some sort of velvet on the bottom for that added touch. Perfect! 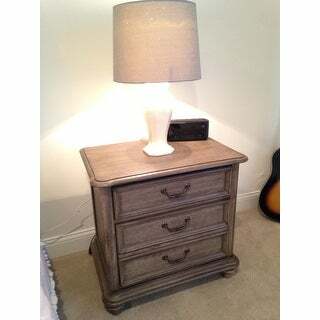 We bought the 4-piece bedroom set in the Rustic Grey and realized we wanted another nightstand to round out the set. This is a beautiful nightstand with tons of room. While it looks like there are three drawers, there are only two. One regular drawer and one deep one. We've had this nightstand for a year now and it has lived up to all of our expectations! This came super fast shipping and very well packaged. The legs are inside the large drawer and the finish on it is superb. I originally purchased only one, but now feel the need to get a 2nd to complement the other side. The first drawer is felt lined which is awesome. I have a king size bed and it fits great. Doesn't overpower the bed and doesn't look miniature either. Very happy with this purchase. 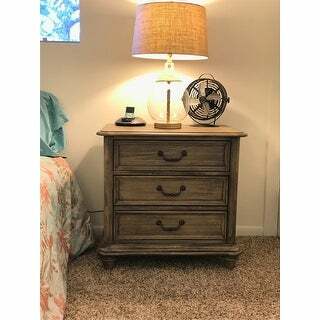 This night stand is very solid and has a nice upper felt lined drawer and a huge bottom drawer. The color is true to the picture and has a durable finish that still looks new after 1 year. I bought this extra nightstand since I also purchased the whole bedroom set. Very pleased with the quality. Color is so unique but beautiful. Drawers glide open easily. Top drawer velvet lines, the bottom is not 2 seperate drawers its just one DEEP drawer, which is great for pj sets. Didnt realize that when i first purchased, but its very useful to me. Love the color and style, photo accurate, However it is not 3 drawers it is 2. The bottom is one deep drawer, which looks like 2. Lovely two drawer piece with felt lining in top drawer. Would buy again. 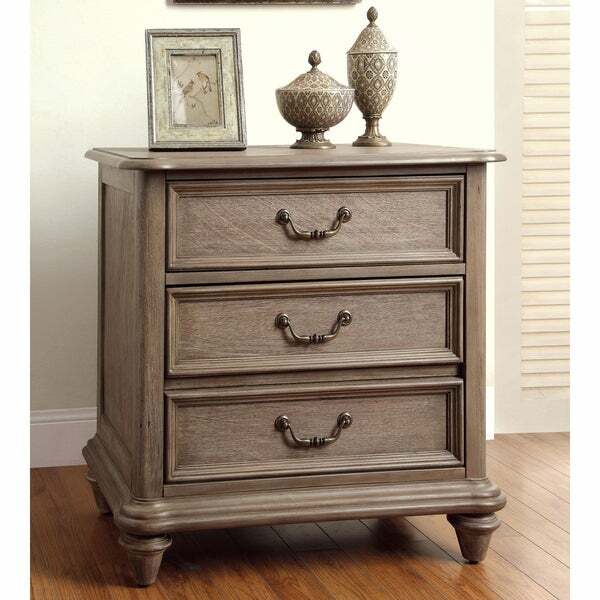 Love this night stand, the handles make it look elegant and the finish is a really great color that is grey/brown. The larger drawer at the bottom with the double facade is great for storing larger items like a heating pack and large pump lotion bottle. the tarnish with any heat. Love the gret/brown mix of color in this nightstand. My only complaint is that it looks like 3 drawers but is only two. The bottom drawer is very deep and not ad useful as 3 drawers sould be. Well made piece of furniture along with the rest of the bedroom set. It is a beautiful color and looks perfect in my new house. This nightstand is so cute and built very well. It had a couple of paint smudges on it though - not quite sure how that happened. The box it arrived in was incredibly sturdy. The color is more of a rust grey. It matches perfectly with the rustic truffled headboard I purchased separately from here on Overstock. My only issue is that I wished that the made the top drawer a little larger which would take away from the bottom but it would’ve worked out nicely. The color and material and it's design is fantastic. The ease of its functionality like the drawers and the overall finish of my bed set is beautiful. If I have known before that BIG O does Price Match as long as you are a BIG O member, I will do Price Match on this set. I would buy it again if I need to. So, being a BIG O member is beneficial. Yes, the back is finished. "Does the nightstand require assembly? I'm confused on the order screen it says assembly required, but in answer to another customer's question it said the nightstand comes fully assembled. Which is it? Also, if it does require assembly, how much does this involve?" It comes fully assembled with the exception of screwing the legs on which took all of two minutes. "Do the drawers have guide rails?" The drawers have metal side glides. "So per earlier question, is it meant as 3 drawers or 2? Could u pls clarify? Thanks." Hello JP, I ordered the complete bedroom set. As far as this nightstand....it does have three panels which WOULD indicate having 3 drawers, but this actually only has 2. The top panel (drawer) is a single drawer and the bottom two panels is 1 large drawer. I was a bit confused as well when I received them, but the large drawer has grown on me and I actually like it now. Hope this helps. "The description says it has 3 drawers. I just received this (2 actually) and there are only 2 drawers. It's one big bottom drawer." Hello Robin S., we apologize for the inconvenience. If you'd like to make a return, please contact customer care at 1-800-843-2446 for assistance with this issue. Thank you for shopping with us. "will the drawer trails be installed before shipping?" Hello Iris, the nightstand arrives fully assembled. Thanks for shopping with us! It looked sturdy, elegant, and nice.